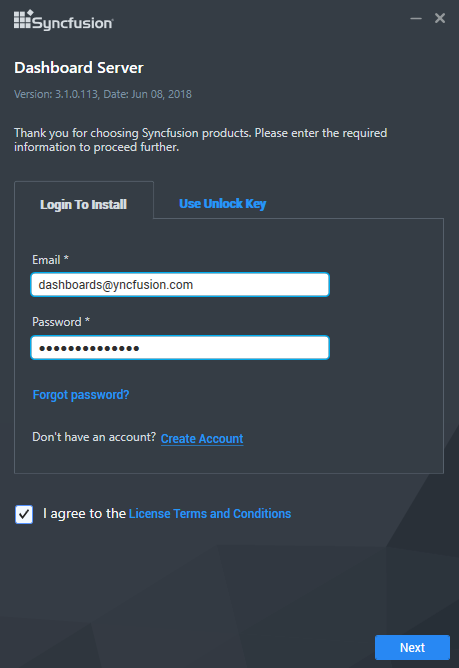 Installation and Deployment of the Syncfusion Dashboard Server. 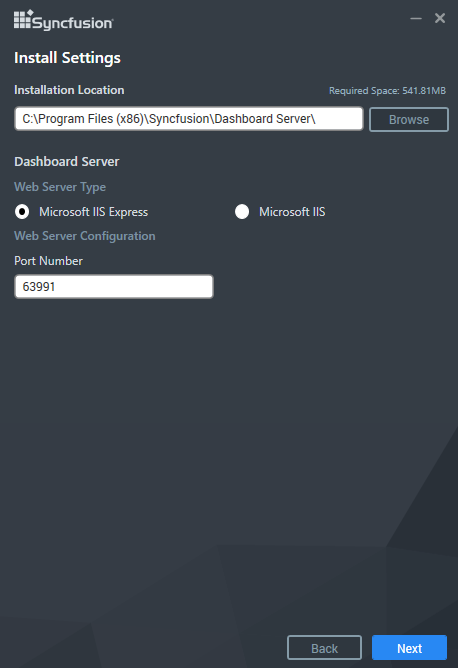 This section explains on how to install and deploy the Syncfusion Dashboard Server. The key to unlock the setup will be sent to your registered e-mail address. This topic details the steps required to install the Dashboard Server. To learn about the system requirements needed to deploy the Dashboard Server in your business environment, see System Requirements. 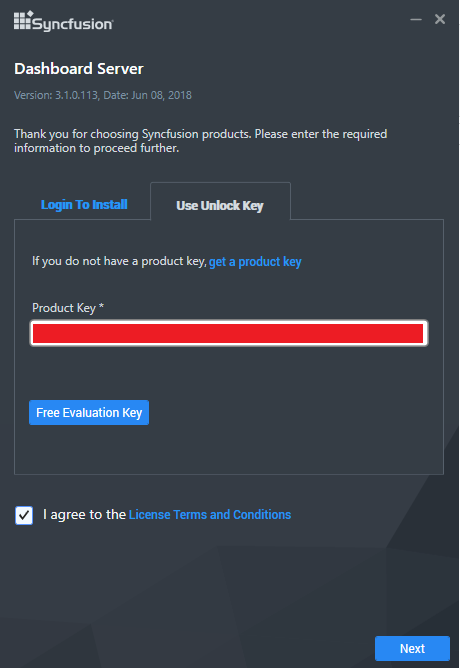 Run the Dashboard Server Installer and type in the credentials of your Syncfusion account to unlock the setup. 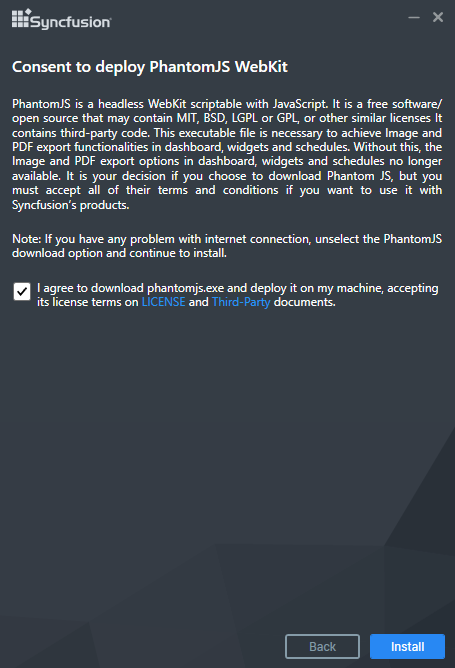 You can check the License Agreement of Dashboard Server by clicking on the License Terms and Conditions. After you read the license agreement, click on Next to select the installation server type, location and the port number on where the dashboard server has to be hosted. 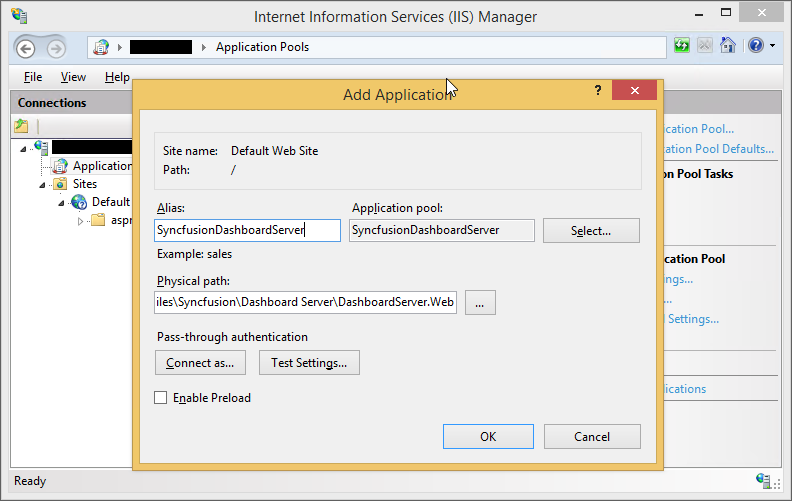 Need to provide the Port number, Location and Site Name to host the Dashboard Server into the IIS. Dashboard Server will be installed with the below components in the mentioned installation location. Once the installation completes you can start the dashboard server by checking the “Start Dashboard Server” in the last screen and click on finish. Or you can also start the dashboard server from the shortcuts available in the desktop. Desktop shortcuts will be provided for starting and stopping the dashboard server and for the dashboard designer. Dashboard Server does not support multiple versions installed on the same machine. Dashboard Server cannot be downgraded to the previous version. 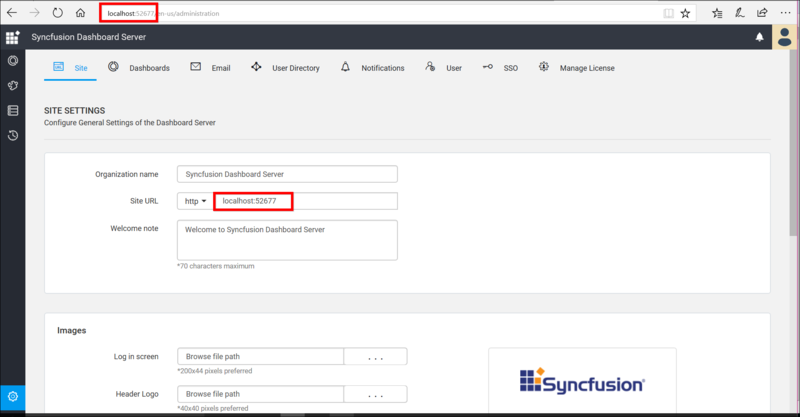 1.Double click the Syncfusion Dashboard Server setup. 2.Syncfusion Dashboard Server setup will be extracted in Temp location (%temp%). 3.Copy the extracted Dashboard Server setup to some other location and cancel the installation. 4.Open the command prompt with administrative privileges and run the extracted Dashboard Server setup with the following arguments. 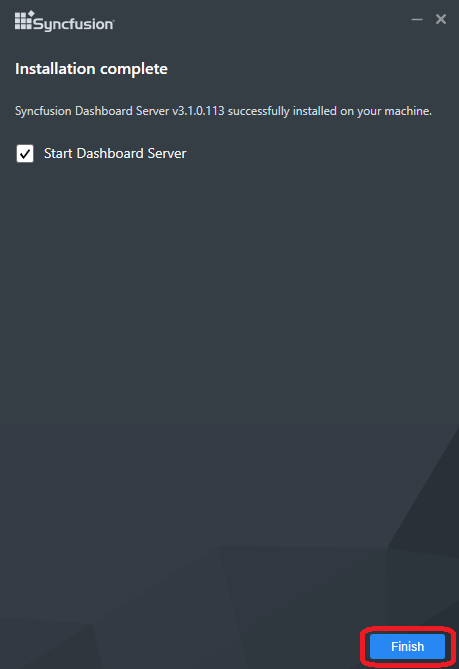 Now, Syncfusion Dashboard Server will be installed in silent mode. We have shipped two utilities with the Dashboard Server to host the application in IIS and in IIS Express. Run the program ConfigureDashboardServerIISExpress.exe from the following installed location to host the dashboard server in IIS Express. Note: By default, it will show a random port number. An unused port can also be chosen to host in that port. Click Submit and this program will host the application in IIS Express and Dashboard Server application will be launched in browser. Dashboard Server can also be hosted in IIS by following the below steps. Type in a unused port for the Dashboard Server as like in the above image. 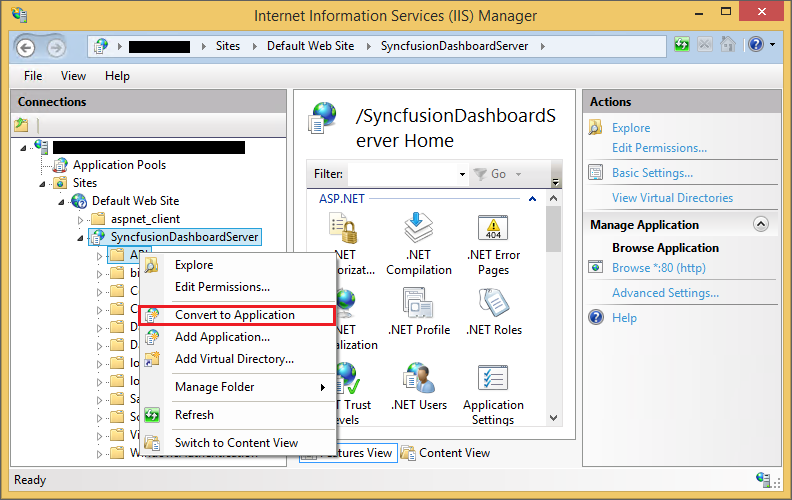 This program will host the application in IIS and the Dashboard Server can be opened from the browse button in the IIS. Dashboard Server can also be hosted as Application in IIS by following the below steps. 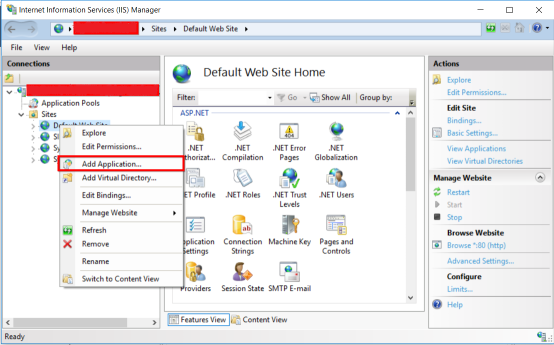 Right click the Website hosted in IIS and choose Add Application as below figure. We have the following folders to be converted as application. To enable SSL for the Dashboard Server application, you will need a valid SSL certificate. Please check the below link on how to Obtain an SSL certificate and install it to a website in IIS. It is must to enable the SSL for the Dashboard Service if you have configured the SSL for Dashboard Server Application. To configure SSL for Dashboard Service, run Syncfusion Dashboard Service Configuration Manager application. Dashboard Server is deployed in the below location by default. 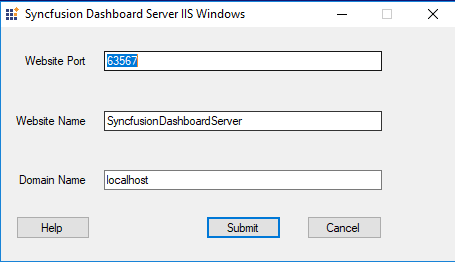 We have shipped a utility with the Syncfusion Dashboard Server application in the below location by default. Choose the type of configuration required and click on Save button. Syncfusion releases several major versions in a year. Each version includes new features, bug fixes and other improvements. Syncfusion Dashboard Server can be upgraded to latest version at any time manually, and there are no automatic updates for Syncfusion Dashboard Server. Before upgrading, you can refer the features and enhancements from the Release Notes. 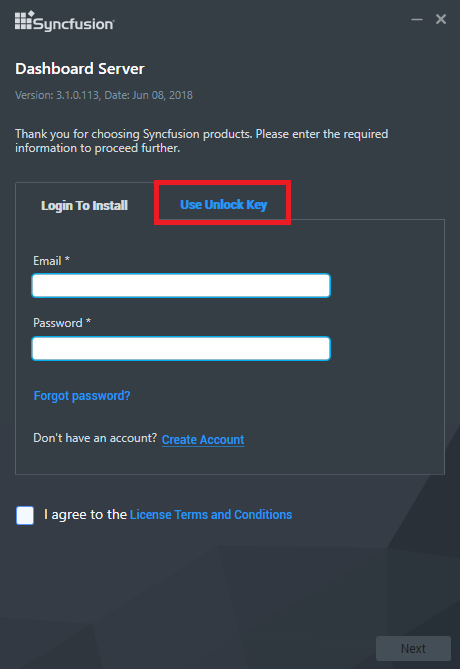 Syncfusion recommends you to follow below guidelines while upgrading the Dashboard Server from an older version to latest version. Save all the open settings and the unsaved items. Ensure no one is currently working with dashboards. Inform about the maintenance time to the users. For SQL, MySQL, Oracle and Postgre SQL databases, make sure you have a valid network connection to the database while upgrading to the new version. 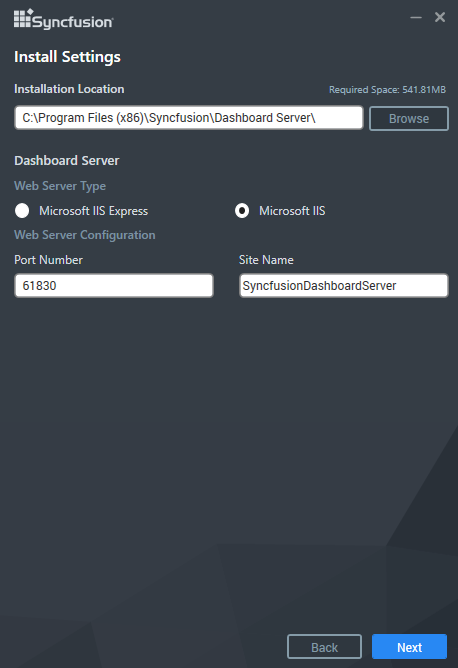 Download the latest Syncfusion Dashboard Server from here. Follow the installation steps from the above section Installation. The upgrade process will retain all the resources and settings from the previous installation. Dashboard Server updates the database schema of your current version to the new version. Please ensure the below steps if the dashboards are not rendered properly. 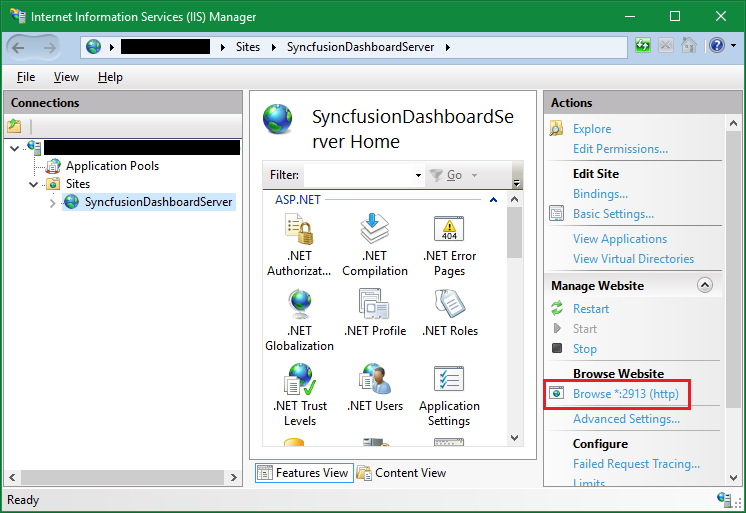 Ensure that the Site URL is updated properly as the hosted Syncfusion Dashboard Server URL.